Project File : The fully qualified path to the setup project file (*.ipr). You can also compile Installshield Objects (.ipo) but you'll have to specify the .ipo file without using the file dialog. You will also have to manually enter the Media name, as the automatically detected media names only work for .ipr files. Output Directory : The fully qualified path to where you want the output folders and files to be placed. The built setup files will be placed in the "Disk Images\Disk1" subfolder in the location you specify. 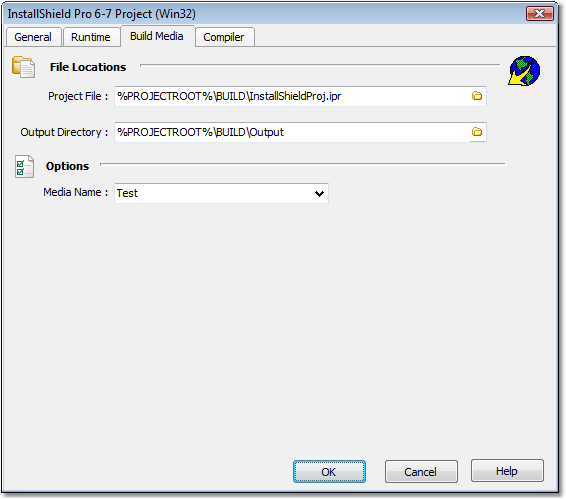 Media Name : The media name that you entered into the Media Wizard - Media Name Panel in InstallShield. Script File : Specifies the name of the Setup Script. IFX.obl Location : The location of the ifx.obl file, defaults to the value specified in the Options dialog. ISRT.obl Location : The location of the isrt.obl file, defaults to the value specified in the Options dialog. Include Path : Specifies the search path for source files that have been included in the setup by means of #include statements. 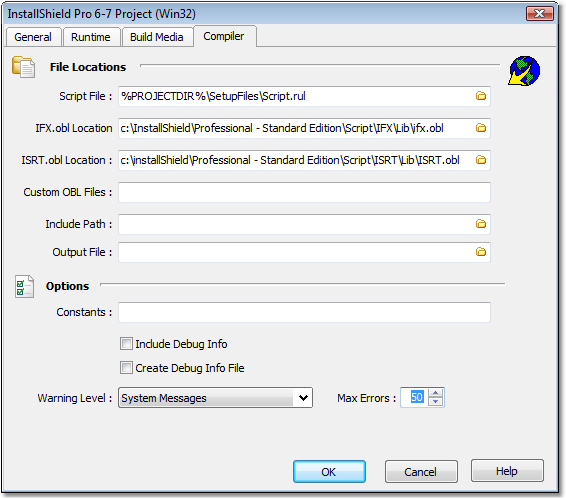 Output File : Specifies the file name to assigned to the compiled script. Include Debug Info : Specifies that debugging information should be included in the compiled script file, so a debugging information file is not needed. Create Debug Info File : Specifies that a debugging information file should be produced. Warning Level : Sets error reporting level for the compiler. Max Errors : The maximum number of errors before the compiler aborts.